Next up in our Featured Customer Series is the American Paint Horse Association, which happens to have one of their two largest events of the year coming up in June. The 2010 Summer World Championship Show takes place June 23- July 3 at the Will Rogers Memorial Center in Fort Worth, Texas. The APHA World Championship Show is the largest and most competitive exhibition of the Paint Horse anywhere in the world. The summer show features the association’s Youth championships as well as Open and Amateur reining and cattle classes. Just a brief glance at the class schedule of the summer show gives you an idea of the amazing versatility showcased by the Paint Horse. Competitors will strive for the world championship in events as varied as reining, showmanship, roping, equitation over fences, Western pleasure, and halter classes. In addition, new to the show this year are Open All-Breed Jackpot classes (allowing entrants from other breeds) in team roping, team penning and ranch sorting. More information, including full class descriptions and the Premium Book, is available on their web site, www.aphaworldshow.com/summer. For those of you who may not be entirely familiar with the APHA, the association not only records and preserves the pedigrees of the American Paint Horse (they’ve recorded nearly 1 million horses since 1964) but also regulates competition, promotes recreational equine activities, and encourages responsible breeding among other programs. Pictured above is Shannon Sullenberger and her world champion mare Jettn Champagne Chex. 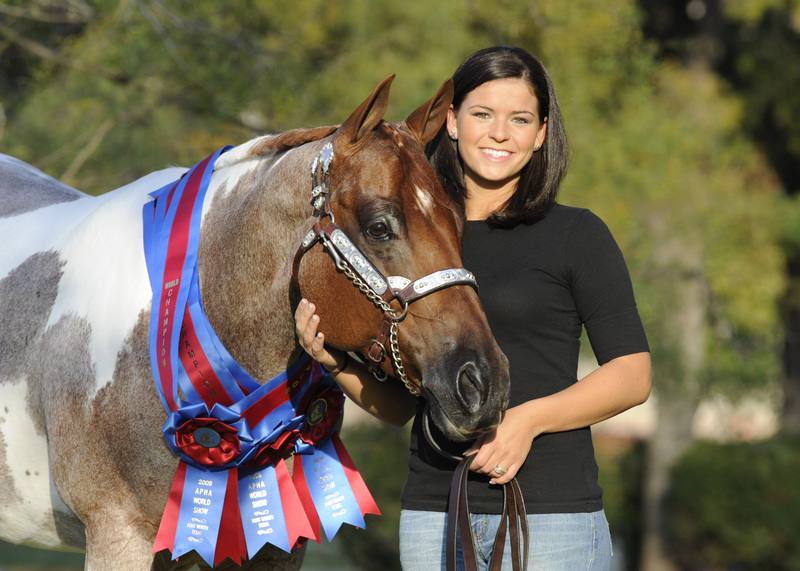 The pair were the team to beat in the All-Around Novice Amateur division at the 2009 Fall World Championship Show. The APHA chose Easton sashes with satin centers for their awards. Finalists also receive Wheaton rosettes. Finally, are you interested in having your group or organization highlighted in our Featured Customer Series? Send us an email to info@hodgesbadge.com with blog in the subject line.